All involving a tight integration of sensing systems, analog electronics, embedded systems concepts, and physiology-driven data analytics. Our philosophy is to work collaboratively and efficiently, with the ultimate objective of improving human health and performance for older Americans, patients, athletes, soldiers, and children alike. Below is a summary of each of these application areas, with some exciting activities that we are currently pursuing in our lab. The ballistocardiogram (BCG) signal is a non-invasive measurement of the reaction forces of the body to cardiac ejection of blood into the vasculature, and the movement of the blood through the vascular tree. 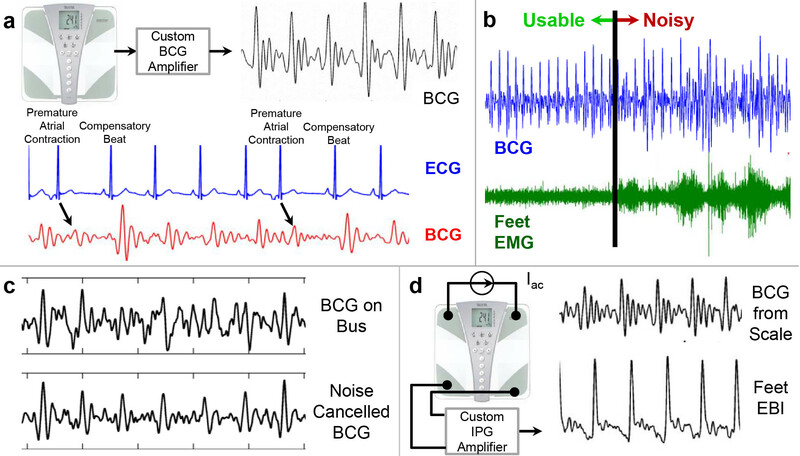 One area of our research focuses on BCG signals: how to measure BCG signals using wearable technology, how to interpret BCG signals to assess cardiovascular health parameters such as cardiac output or blood pressure, and how to use BCG technology to improve home management of chronic disorders such as heart failure. The figure below shows some of our prior work in BCG measurement and analysis where we demonstrated high quality BCG acquisition using a modified home weighing scale. Our lab has several efforts focused on developing solutions for advancing the state-of-the-art in on-body sensing of biomechanical parameters. As part of a DARPA-funded effort, we are researching how a combination of acoustical emissions from the joint – measured by wearable miniature microphones – and vector electrical bioimpedance (EBI) can quantify joint health status for athletes following musculoskeletal injury during rehabilitation. The figure below shows some of the results based on the EBI measurements. We are also collaborating with the Georgia Tech Clinical Biomechanics Laboratory in Applied Physiology in a project aimed at developing an instrumented ankle foot orthosis for optimizing walking. We are especially enthusiastic about projects that can leverage recent advances in miniaturized sensors and embedded computing to impact pediatric patient safety and quality of life. We are working on projects along these lines in collaboration with physicians at Emory University and Children’s Healthcare of Atlanta (CHOA). These projects are funded by the Georgia Tech / CHOA partnership through seed grants, and are at an early and exciting stage of development. For more information, contact Prof. Inan.